On a cold Sunday in late February, I took shelter from the snow and wind at the café at the Boijmans van Beuningen Art Museum. The annex where the café is situated has large picture windows on three sides with a good view of the museum park and I fancied sitting there with a large cup of their excellent cappuccino, watching the snow flakes fall. So, when I got there I was a little dismayed to see how crowded the place was, how long I would have to queue for my coffee, and how remote the chances were that I would secure a slice of lemon pistachio cake. However, I needed some reinforcement before heading back into the cold, so I queued and found myself a seat. It was only then that I realized I had walked into an opening party. Things are informal here in the Netherlands. It’s perfectly possible to crash an opening party at a gallery and not realize it. It was the sharp suit that gave it away. I glimpsed it through the throngs of sensibly or casually dressed people in dark hues. The suit glittered like a fleck of gold at the bottom of muddy sediment. It was hung on the skinny frame of a man seated at a table, engrossed in drawing and seemingly unaware of being the centre of attention. It took me a moment to realize that he was signing catalogs for the exhibition Pushwagner: Soft City. I managed a quick snapshot of the suit as the room started to disperse after the speeches, flowers and applause. 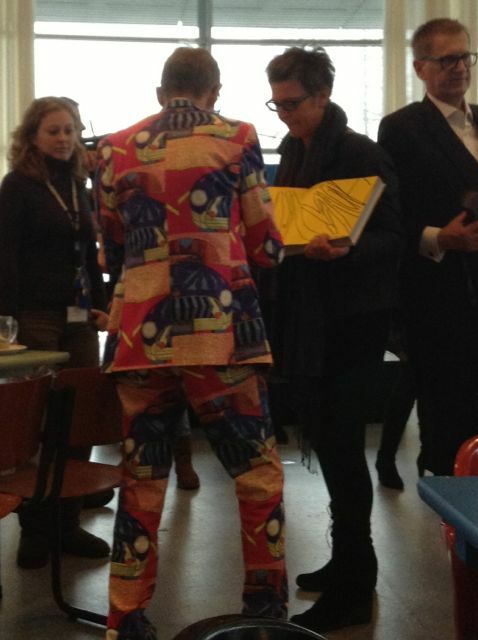 The suit is designed by Moods of Norway and the pattern is based on one of Pushwagner’s drawings. Whether the suit is actually available for wider sale, and whether the collaboration between the designers and the artist has survived this initial effort, I have no idea. I’m a little doubtful. Hariton Pushwagner was born Terje Brofos on May 2, 1940 in Norway, roughly one month after the German army invaded the country. In early December 1944, an older boy sat him on a sled and pushed it under the wheels of a bus. At least, that’s how the artist tells it, and the expression on his face as he tells the story in the film Pushwagner (2011) suggests it is true to him, and isn’t that what counts after all? His parents and the doctors thought he would die, but he survived, and since then he has survived drug addiction, alcoholism, homelessness, poverty, you-name-it, to find himself in his 70s with a reputation as one of Norway’s most important contemporary artists. That claim made me wonder about the context for making such a judgment. Other than Ingar Dragset of Elmgreen & Dragset, who did The One & The Many at the Submarine Wharf in the port of Rotterdam in the summer of 2011, my knowledge of the arts in Norway is pretty vague. A quick check with the online version of Store norske leksikon found 117 artists listed under the heading Norsk samtidskunst (Norwegian contemporary art), so there’s obviously much to learn about Norway. One of the descriptions of Pushwagner floating around the Internet, particularly on British websites, is a ‘modern-day Munch.’ It was interesting then to read on the website of Norsk rikskringkasting (NRK, the Norwegian Broadcasting Corporation) a quote attributed to Pushwagner on a visit to Tate Modern in London last year to see Edvard Munch: The Modern Eye. For å være ærlig blir jeg i dårlig humør av å se bildene hans. De er så dystre. To be honest, looking at his pictures puts me in a bad mood. They’re so gloomy. I suppose ‘gloomy’ is a relative term. These photos show details from Jobkill, one of seven works that form the Apocalypse Frieze. For a look at the whole image, click here. To introduce the exhibition at Boijmans, here is Anthony Spira, the director of the MK Gallery, Milton Keynes, which collaborated with Boijmans on Pushwagner: Soft City. What impressed me the most about the artist’s work is the amazing use of perspective. Pushwagner employs relatively simple and repetitive line drawings to create images that seem to open up into spaces so endless they swallow you up and give you vertigo. Look too deep into them and you might find yourself falling, falling, falling. In 2011, Even Benestad and August B. Hanssen released a documentary about Pushwagner that they had been working on for three years. It must have been like playing with a live grenade. The last word goes to his biographer, Petter Mejlænder. Han er et paradoks; banal og dypsindig på samme tid. Det er ikke så lett å forstå fenomenet Pushwagner. He is a paradox; banal and profound at the same time. It is not so easy to understand the Pushwagner phenomenon. So now I know where they got the idea for the Mad Men intro sequence. Or is it the other way round? well, that was interesting! Thanks. Took me a while to get to it (was with the family in China/Japan) and just back from a business week in Brasil – so am behind in my e-mail reading.